What if we told you there was a new-this-weekend burger joint called Big Chef Tom's Belly Burgers that just got opened by a Food Network Star finalist who makes his burgers entirely out of pork belly, and already has one of SF's best burgers despite not even having a restaurant prior to this week? Would you say, "Please show me pictures of the best five burgers immediately"? Thought so. Fried chili pepper aioli, Cotija cheese, and tomatillo relish. Totally classic. Right. 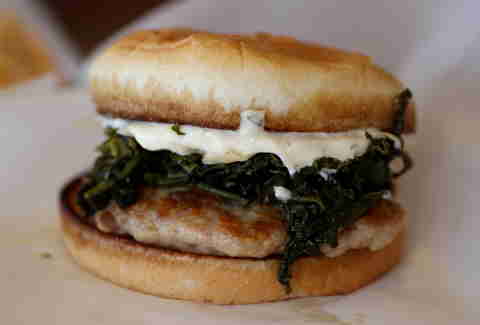 Inspired by Italian roast pork sandwiches he used to get in Philly (which's where Chef Tom is from), except these come with sautéed broccoli rabe, sharp Provolone, and Italian herb mayo. This patty's topped with salted pineapple, iceberg lettuce, and Thai peanut sauce, and named after the bad guy from the classic movie Kickboxer. Note to burger chefs: if you don't have a burger named after a villain in a Van Damme movie, you're doing it wrong. Like a banh mi but in pork belly burger form, this dude tops the namesake patty with fresh cilantro, hard-boiled egg, and Vietnamese caramel sauce. 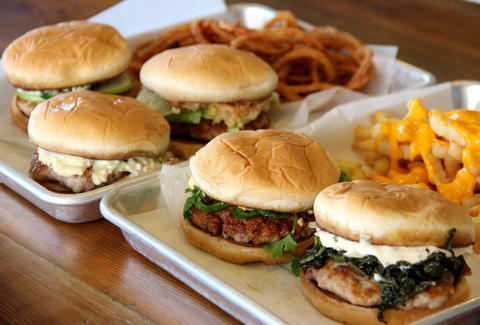 Where Are the Best Burgers in SF? We Tried Them All to Find Out. A Chef Tom personal-favorite, this is the All-American (rosemary mayo, sliced Granny Smith apple, sharp cheddar) but with added jalapeños and *gasp* a patty made from ground chicken thigh! That's right, you can get your patty in chicken form (or, ugh, vegetarian). That's right, part two: you can add the crap out of jalapeños. And totally should. 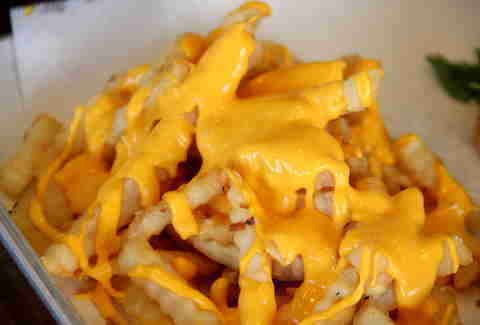 They also have sides you have to try, like the buttermilk- and spiced-flower-dipped crispy red onions, or the house-made crinkle-cut fries you can (and should) get covered in Cheez Whiz (not house-made).